The main purpose of Genuino (yes, the open-source microcontroller board) is to build systems that could interact with outside world i.e., accept input or data (switching input, sensor signal, keypress), process it and produce an output (turn on/off an LED, motor speed control, display message or value etc.). There are different types of input and output devices or components that you can use with your Genuino board. 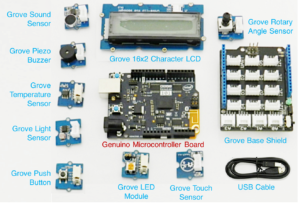 Grove kit is one such modularized collection of various components that can be easily connected to Genuino board and can extend the system functionality. They enable development of a meaningful plug-n-play system in no time. A complete list of Grove input and output modules that are Genuino compatible can be found at – http://wiki.seeedstudio.com/wiki/Grove_System. For the tutorial series, we are going to work with a few Grove modules listed at here. Grove eco-system of modules offers a “base-shield” sits on top of your Genuino board and facilitates easy and intuitive connection of other grove sensor and actuator modules to Genuino. You’ll have to modify the ‘LED Pin’ from 13 to 3, as we connected the LED module to D3. Compile and upload the sketch, you should see LED blink.